Roaring crowds of spectators cheer on their favourite runner. A gladiator bites the dust in the arena, and falls in a pool of blood. Two wealthy ladies inspect the fine silks at the shop run by a Jewish merchant. In the forum, slaves are busy erecting a statue of the current emperor, while others outside the city are preoccupied with repairs to the aqueduct. The people around the Eastern Gate make way for a chariot carrying a senator from his rural villa to his city mansion. 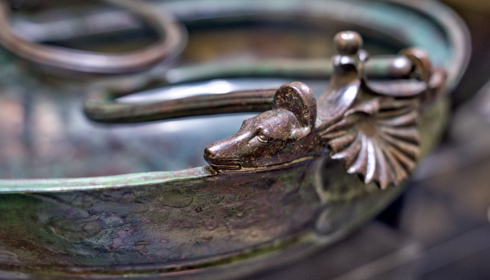 The lives of the residents of Plovdiv in the Roman era were as varied, busy and interesting as are ours. Plovdiv, which was then known as Trimontium and Philippopolis, was one of the largest cities in the Balkan lands of the empire. Situated on the then navigable Hebros River (today's Maritsa), it lay at the intersection of the roads from the Bosporus to Central Europe, and from the Danube to the Aegean. Fertile lands spread around it, and the nearby Rhodope mountains, with their dense forests and nimble rivers, supplied its 100,000 citizens with water and its merchants with timber, wool and honey. A cluster of three hills offered protection. The place where Plovdiv stands was deemed ideal millennia before the Romans' arrival. There was a Neolithic settlement here, and in the 2nd Millennium BC the Thracians fortified the three hills. In 342 BC, the Thracian city of Eumolpia was taken by King Philip II of Macedon, Alexander the Great's father, and renamed Philippopolis after him. Macedonian control was soon overthrown, but the name stuck, being modified over the generations, and resulting in today's Plovdiv. Alternating diplomacy with war, the Romans spent almost a century gaining full control of Thrace and Philippopolis. In 45 AD, Emperor Claudius (41-54) established the province of Thrace. Philippopolis was not its capital, but the empire invested money, people and effort in it, and made it the seat of the League of the Thracian cities. The 2nd Century was even better. The economy and the city flourished, minting its own coinage. People from all corners of the vast empire mingled on its streets and the whole city expanded onto the plain, spreading far from the protective shadow of the three hills. Later, Philippopolis was not spared the Barbaric invasions, economic crises and the power struggles which ravaged the empire, but it always rose from the ashes of destruction. In the 6th Century, unlike many cities which were abandoned forever, Philippopolis entered the Middle Ages, to continue its eternal transformation. Most of the public buildings, the houses of the poor and the wealthy, the temples and the riches of Roman Plovdiv are lost forever, destroyed by invaders and built on by later inhabitants. Yet, Plovdiv is probably the Bulgarian city with the richest and best preserved Roman archaeological heritage. The marble theatre of Philippopolis is the tastiest piece of all. Built around 108-114, in the crevice between two hills of the city acropolis, it had a capacity of 5,000 people and an astonishing vista of the Thracian Plain and the Rhodope. Popular tragedies and comedies, song competitions and gladiator games attracted people there. Even today, the most telling example of its continuing fascination is right before your eyes – the theatre steps have been worn down by the feet of thousands of spectators. The hills around the theatre are criss-crossed with Thracian, Roman and Byzantine fortification walls. They often merge with one another and are overbuilt with the beautiful 18th Century mansions Plovdiv is famed for. The best spots to see how the constructions of the different eras of Philippopolis overlap in an inimitable puzzle are Nebet Tepe, the Hisar Kapiya gate, with its round tower few metres away, and Atanas Krastev Square. The 2nd Century economic boom produced another majestic public building in Philippopolis, the stadium. With a capacity of 30,000 people, it was a silent witness to the fierce competitions of the city games, and of the devastation brought by the Goths in 251. The stadium survived to the 11th Century, but was later built over and forgotten until its rediscovery in 1923. Today, its semi-circular end is nicely exhibited at Antichen Square, next to the 15th Century Cuma Mosque. The length of the stadium is still underground, with a section on view at the underground level of a trade centre. It is easy, though, to follow it in your imagination. The pedestrian shopping street follows the ancient track for more than 200 metres. The forum of Roman Plovdiv, as in any ancient city worth its denarius, was a huge open area where trade was conducted, people congregated, and the official emperor's cult received the obligatory veneration. 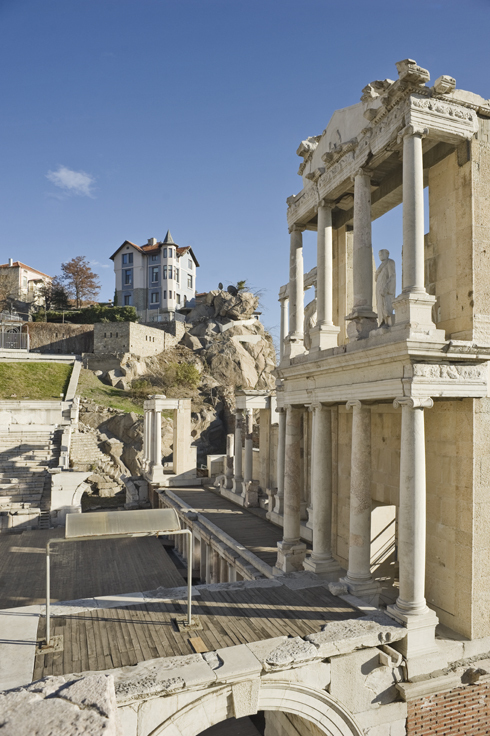 In its heyday, the forum in Plovdiv spread over 10 hectares. Today, a small portion can be seen near the central post office. Best preserved are the partially restored remains of the Odeon, a small semi-circular building where the city council used to meet. 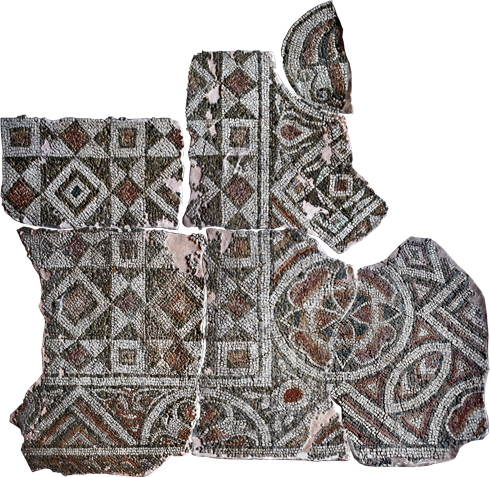 The remains of some marvellous mosaics from the houses of wealthy Philippopolis families are now in the Plovdiv Archaeological Museum, along with a collection of tombstones and sculptures. In the Arheologicheski Underpass, however, a more real experience awaits. There, on the premises of an art gallery, a part of a well-to-do local family house from the 3rd-6th centuries is exhibited in situ. Its centrepiece is a beautiful mosaic of Eirene, the Greek goddess of peace. In the first century of Roman rule, Philippopolis was far from the tumultuous borders, so the houses and the buildings on the plain were undefended. During the rule of Marcus Aurelius (161-180), however, Barbarian invasion threatened. A mighty wall was built to protect the city. The remains of the most important gate in the fortress wall, the Eastern one, which led to Constantinople, are still preserved on Aleksandar Malinov Square. Roman Philippopolis was a place of many temples and deities, with local and imported cults attracting thousands of believers. The main temple, devoted to Apollo Kendrisos and later to the emperor, stood outside the city walls, on the top of the hill now known as Dzhendem Tepe. In Philippopolis there was even a synagogue, the biggest and oldest building of this type in the Balkans. In the first centuries after Christianity became the official religion many beautiful churches were built. Sadly, most of these are gone now. A pool was built over the remains of the temple of Apollo. The synagogue was destroyed to make room for an apartment block, and the excavated parts of the grand Bishop's Basilica are in a deplorable condition. There is, however, one place where you can relive part of Roman Plovdiv's religious past. The Small Basilica on Maria Luiza Boulevard was discovered in 1988-1989 and amazed archaeologists with its mosaics, which are exquisite in appearance and rich in early-Christian symbolism. The church operated in the 5-6th centuries, and was abandoned along with everything else on the plain, when the citizens realised it was too dangerous to live there and withdrew to the three hills. The Small Basilica was declared a monument of culture, the mosaics were removed and put into storage, and the building was left to the weeds. About 20 years passed, until the America for Bulgaria Foundation began the long process of bringing the Small Basilica back to life – and to tourists. The church foundations were cleared and restored, and the mosaics, after extensive conservation, were brought back. 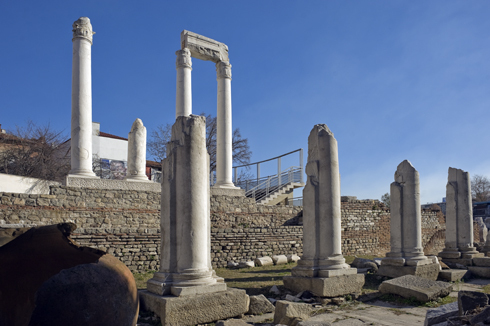 The Small Basilica was turned into an exhibition space which recalls the past of Roman Plovdiv. 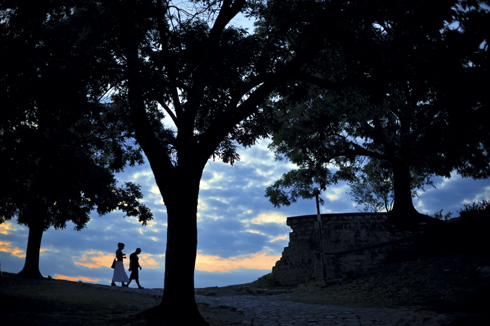 It will soon be open for visitors, an event which will enhance Plovdiv's ancient charm even more. In 2010, the America for Bulgaria Foundation sponsored the restoration of the Small Basilica in Plovdiv, which at the time was only an overgrown ruin. Conservation and restoration of mosaics began immediately, led by restorer and artist Dr Elena Kantareva-Dechevska. In 2011, restorations of the building began as well. As time passed, the plans for the future of the Small Basilica took a grander shape: to make the ancient church the centrepiece of a larger open air archaeological museum along with the surrounding ancient infrastructure - a fortress wall and a tower, a street and a well. The project is still in progress and is scheduled to be completed in August 2013. When finished, the basilica will function as a small exhibition area, too. The investment amounts to 1,530,000 leva, with 1,230,000 being donated by the America for Bulgaria Foundation and the rest from the Culture Ministry and the Plovdiv City Council.